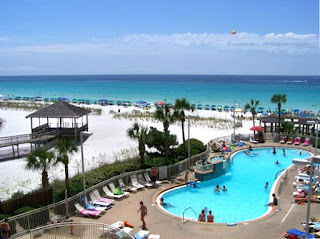 Located on the beach in Destin, Pelican Beach Resort condominium is situated in the center of Florida's beautiful Emerald Coast. This non-smoking two bedroom/two bathroom condo was beautifully renovated in late 2011 with a brand new kitchen with granite counters and with high quality new furniture added throughout including a big 37" diagonal Flat Screen TV with a DVD player! Both the master and guest bedrooms are also fitted with flat panel TV's with built in DVD players. This condo is beautifully decorated and very well maintained so you can be sure of a very comfortable vacation stay!